Ideal for general purpose dolls house and model wiring. Also suitable for extending of dolls house light fitting wires. 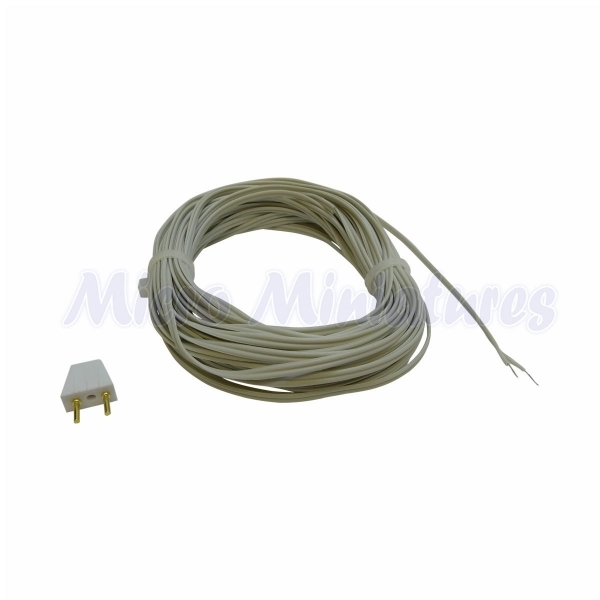 In dolls house applications, this twin core stranded flat cable is small and ideal for hiding under carpets, in grooves and behind wallpaper etc. Whilst in modelling applications it is particularly handy in small spaces. Because it is slightly stiffer and a lot stronger than the normal cable supplied for dolls house light fittings or wire used with LEDs it is more useful and easier to use as once bent it will retain it’s shape. For example if bent at 90 degrees it will stay there. 28AWG (0.09mm²) Stranding: 7/36 (7×0.13mm) Insulation thickness: 0.010 (0.25mm) The lighting plug in the picture is only shown for scale purposes, giving you a better idea of size.